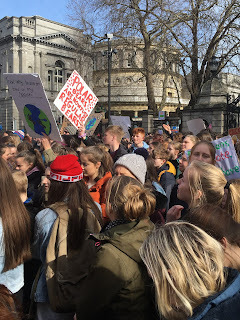 Last week tens of thousands of school pupils in Ireland, and in over 100 countries across the world, took part in an unprecedented demonstration highlighting the threat to humanity from climate change. Thousands took part in an impressive protest outside the Dáil. They were all united in their demand that governments must do more to save the planet. The extraordinary enthusiasm, commitment and determination of the young people, was inspirational. Friday’s protests are the latest in the ‘school strike movement’ that has been inspired by the actions of Greta Thunberg, a 16 year old Swedish teenager. Thunberg has sat outside the Swedish Parliament almost every Friday since last summer demanding that her government implement the Paris agreement on climate change. Just before Christmas she spoke at the COP24 climate talks that took place in Katowice, Poland. Her scathing criticism of the international community and of governments struck a chord with many young people – and older citizens. Thunberg told political leaders: “You only speak of green eternal economic growth because you are too scared of being unpopular. You only talk about moving forward with the same bad ideas that got us into this mess, even when the only sensible thing to do is pull the emergency brake. You are not mature enough to tell it like is. Even that burden you leave to us children. She told political leaders: “You say you love your children above all else, and yet you are stealing their future in front of their very eyes”. Four years ago 197 countries came together in Paris to map out an agreement to hold the rise in global average temperatures to “well below 2 degrees Celsius above pre-industrial levels” and to make a significant effort to keep it to 1.5 degrees Celsius. Last October the UN Intergovernmental Panel on Climate Change (IPCC) published a shocking report which underlined the catastrophic risks posed to humanity by climate change. The authors of the report – the world’s leading climate scientists – warned that we have only 12 years to limit climate change before the people of the world face extreme droughts, heat, floods, increased food insecurity and water supply, and increased poverty for hundreds of millions of citizens. The world is already one degree warmer than preindustrial levels. This might not seem a lot but the effect was very obvious last year with unprecedented heat waves, hurricanes and typhoons. Destructive human exploitation of our natural resources; damage being done by climate change; and the effect on world animal and insect populations since 1970, are all having a significant impact. According to the 2018 Living Planet Index published by the World Wildlife Fund Central and South America have suffered an 89 per cent loss in species populations since 1970. On the island of Ireland the National Biodiversity Data Centre reports that one third of our bee species – which are essential for pollination – is either regionally extinct or vulnerable. The current evidence suggests that without serious remedial action by governments we could see global temperatures increase to between 3 and 5 degrees Celsius. Even at 2 degrees Celsius the disappearance of Artic Sea ice threatens the jet stream which determines our weather systems. The IPCC report concludes that a 2 per cent Celsius increase in global warming will lead to more heat related deaths, smaller crop yields, more extreme weather events, and slower economic growth. Just before Christmas delegates from states around the world gathered in Katowice in Poland for a two week conference to revive the Paris 2015 deal. The UN Secretary General Antonio Guterres issued a stark warning when he said that the world “is way off course” to prevent catastrophic climate change. When the conference was over some progress had been achieved on agreeing how governments will measure and report on their efforts to cut carbon emissions. However, the USA, Russia, Kuwait and Saudi Arabia blocked the conference from accepting in full the IPCC findings on climate change. As if to underline the threat a review of the research of the Intergovernmental Panel on Climate Change (IPCC) published in January in the prestigious journal Science concludes that previous estimates on the warming of the Oceans has been too low. The report states that: “multiple lines of evidence from four independent groups thus now suggest a stronger observed [ocean heat content] warming.” The Oceans are heating up 40 per cent faster than previously believed. The impact of this will be far reaching. The bleaching of coral will worsen – affecting fish stocks – and some species of fish will be forced to migrate to cooler waters. One example of this is the fate of squid in northern Japan. A report in October last year revealed that the population of Japanese flying squid, which has been a key part of the Japanese diet, has been significantly depleted. In 2011 Japanese fishermen caught two hundred thousand tons. Last year that figure was down to 53,000 tons. While over fishing has played its part, so too has the increase in sea temperatures. The Sea of Japan has warmed by 1.7 degrees Celsius and is expected to rise by almost 4 degrees Celsius by the end of this century. Marine life is looking for cooler waters. The evidence is overwhelming. Humanity faces greater challenges than ever before. Without resolute action millions are at risk. In May in the local government elections North and South, and in the European election in the South Climate Change will be a priority for Sinn Féin. But effecting real change and forcing reluctant governments and climate change deniers to implement real and effective policy changes will require a mass campaign. Last week young people showed the way. Their example must guide us in the time ahead.